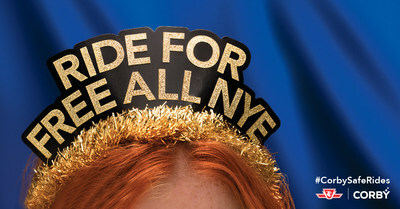 TORONTO, Dec. 5, 2018 /CNW/ - New Year's Eve revellers in Toronto are once again being offered a free ride home this year with #CorbySafeRides. "New Year's Eve is one of the most exciting nights of the year," says Patrick O'Driscoll, President and CEO of Corby Spirit and Wine. "And while we encourage people to enjoy themselves, we also have a responsibility to encourage and remind Canadians not to drink and drive on New Year's Eve or indeed on any other night of the year." To date, Corby has provided more than 1.1 million free rides to people celebrating New Year's Eve in Toronto as part of its annual #CorbySafeRides campaign and has just extended its partnership with the TTC for three more years until 2021. 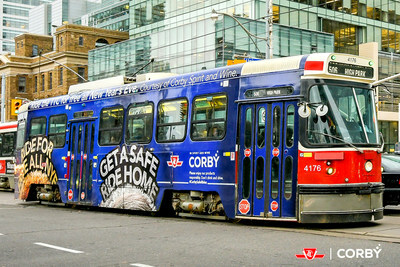 "We are thrilled that Corby Spirit and Wine has chosen to extend its partnership with the TTC," says Rick Leary, CEO of the Toronto Transit Commission. "Providing people with a safe way to get home on one of the most celebrated nights of the year is something that we are proud to be a part of." This year, Corby Spirit and Wine has also partnered with arrive alive DRIVE SOBER® to promote the importance of planning ahead for a safe ride home if you'll be raising a glass this holiday season. arrive alive DRIVE SOBER® provides leadership and programs to eliminate impaired driving and enables people and communities to share resources and information that will prevent injuries and save lives by collaborating with key stakeholders and community partners. From December 1st to 31st, 2018, Corby will donate $1 for every use of the hashtag #CorbySafeRides on Instagram or Twitter, up to $10,000. "Corby's generous donation as part of this year's #CorbySafeRides campaign will help arrive alive DRIVE SOBER® educate even more Torontonians about the importance of safe and responsible consumption," says Pete Wytka of arrive alive DRIVE SOBER®. "This initiative will help us to continue our mission of developing and sharing resources and information with consumers regarding safe and responsible choices."